Another Beautiful Day in Paradise. We had lovely clear blue skies, temperatures in the mid to high 50's and a Northern breeze. With a Northern breeze we decided to head North into the wind. 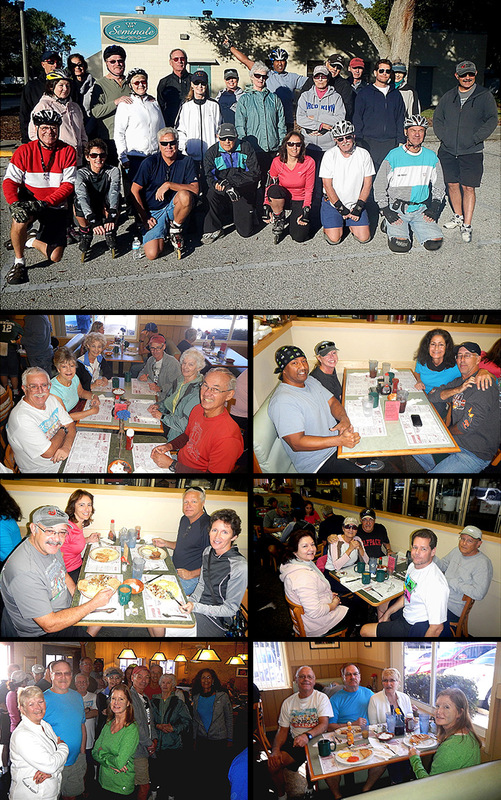 Blader/Bicyclers Sara D, Chris & Theressa V, Tim & Vickie K, Roy H, Dorey Anne, Laura P, Carol J, Rick the Breeze, Ginnie S, Rick P, Bill S, Dimitri F, Vickie S, Rob H, Bruce M, Terri S, Jim H, Steve G, Wendy H, Dee T, Jeff B and Glennis W, who didn't make the picture, came. Welcome all. We ended up in ~3 groups. One group did 10 miles, one group did 11 miles and the other ~13miles. We had 5 Bladers and 19 Bicyclers. Dimitri F, Rob H, Ray B, Michael R, Sandi B and Sara D renewed their Sponsorship for 2014. Thanks all for the website support. We Brunched at Doe Does as planned. We had a big group and Doe Does was very busy but we got in within ~10 minutes. We ended up at a record number of 5 tables. Service was good considering, the coffee flowed freely and the food was great as always at Doe Does. Food ratings ranged from 9.5 to 9.8. We'll give Doe Does a 9.7.